I sure like the impact of the water droplets, being as they are the star of the show. Given that, though, I have a little dificulty in discerning a clear subject of interest. I wish the rider and bike had not been present as I think the image would be more mysterious and focused without them. Your PP work is really good here. Thanks for the feedback, Tom. I would be curious to see a crop leaving the torso of the biker out, I think that would leave everything on the frame covered with droplets. I don't know, the body of the rider seems unnaturally dry. Thanks, Cristobal. 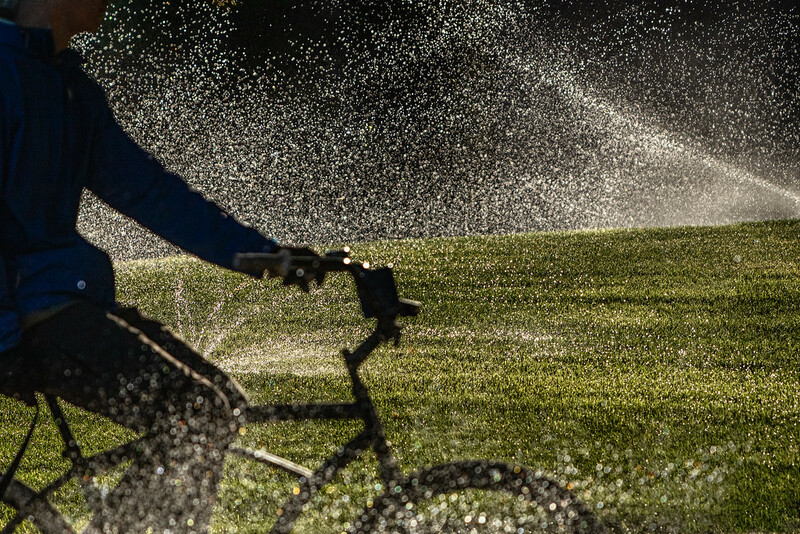 The bike was riding between sprinklers. They weren't as far apart as the telephoto compression suggests. It's an unusual image. My first reaction was that I wanted to see the rider's whole head. But now I'm not so sure--might be more mysterious this way. Something about the light makes me think of photos of astronauts on the moon--maybe it's black contrasted with the white drops. "It's an unusual image." Thanks. "My first reaction was that I wanted to see the rider's whole head. But now I'm not so sure--might be more mysterious this way." The rider was pretty much a dark blob. Also, I didn't want him to be a center of attention.